Forget the Boieng Phantom Eye, the Zephyr takes unmanned solar aviation to the next level. 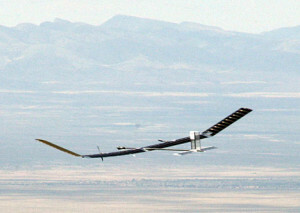 The Zephyr is a super-lightweight, carbon-fiber craft, weighing only 50 kilograms, with a giant wingspan of 22.5 meters. The wings are covered in thin-film solar panels that charge its lithium-sulphur batteries, which power the engines when the sun goes down. This unmanned beauty is breaking all records. It has already spent 7 days and nights in the air, twice the duration of the longest recorded unmanned flight, and it's aiming for a total of 14 days. 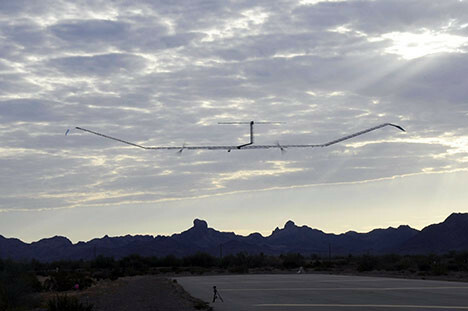 The craft has been flying above the Army's Yuma Proving Ground in Arizona, which is fitting because the potential applications for this type of solar-powered craft include military surveillance (as well as scientific roles like ecosystem observation).